The Columbus Blue Jackets set a franchise record on Friday night for the most wins in a row on home ice. For the seventh straight home game, CBJ fans at Nationwide Arena got to watch wildly entertaining hockey, which ultimately ended with a Jackets W.
This streak has included wins against the Canadiens, Rangers, Capitals, and Blackhawks…and in case you didn’t know, those are the top 4 teams in the NHL right now. Side Note: The Columbus Blue Jackets are good, much quicker than expected. Obviously, most people knew the CBJ’s future was real bright, regardless of the outcome of this season. 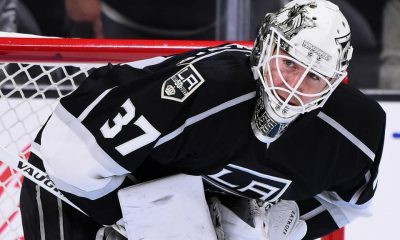 However, nobody could have predicted that last year’s 28th ranked team would be tearing their way through the NHL as they are. Next in line Friday, the CBJ took on the l New York Rangers, who entered play with a 13-4 record. This is a Rangers team who sits atop the Jackets own Metropolitan division and second in the entire NHL, with 26 total points. The first period of Friday’s game started off miserably slow and a little unusual. The Jackets and Rangers are two of the best scoring teams in the NHL right now, and managed to only shoot 6 shots total. It wasn’t until 16:34 in that William Karlsson got the ball rolling. Karlsson would pick off a Rangers pass and drive in an unassisted opening goal, to put the Jackets up by one. Luckily for everyone involved, the following two periods would pack a little more excitement. Sam Gagner would get the second period off to a quicker start. Like Karlsson’s first period goal, Gagner’s would come off of a Rangers turnover and would also be unassisted. This goal marked Gagner’s 7th of the year and gives him the team lead in goals. 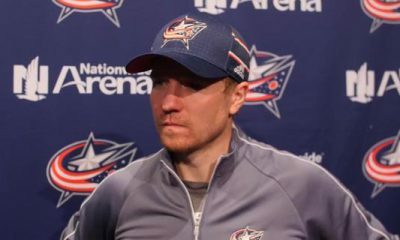 Drama ensued midway through the second period when Matt Calvert took a puck off the forehead. The puck split Cavert’s forehead open, leaving a not so pretty mess on the ice. Calvert would immediately head into the locker room for medical attention and his return looked unlikely. Minutes after Calvert’s departure from the ice, New York would score their first goal of the night. The second period ended with the CBJ clinging to a one goal game. 2-1. Calvert would somehow manage to return to the game a few minutes into the third period. With A throbbing headache and 30 plus stitches. Calvert showed real toughness and grit coming back into the game. The Rangers would score the opening goal of the third period to tie the game at two. At this point, the game was starting to turn into the slug fest that was predicted. With 11:35 remaining and the score knotted at two, both teams appeared desperate to not allow overtime. After a few back and fourth shot attempts, something magical happened. Short-handed with a man down, Ryan Murray snagged the puck off the boards near his own goal and rushed up the ice. Hurling up the ice Murray had a wide open pass to, none other than, Matt Calvert, who buried a shot passed New York Goalie Henrik Lundqvist. This was the Jackets first short-handed goal of the season and no one could dreamed up a better winning shot. So just to sum up Calvert’s evening, gets hit directly in the forehead with a puck, looses pools of blood on the ice, leaves game to get 30 stitches and concussion evaluation, becomes an absolute beast and returns to play, score go ahead goal to win the game. What a night! A lot of players wouldn’t even think to come back into the game, let alone come back and be the key part of the game winning goal. This gives a little insight into the passion and determination this team shares. Boone Jenner would put the cherry on top, scoring the final goal on an empty net with one second left on the game clock. After the game head coach John Tortorella would weight in on the importance of winning at home. “If we want an opportunity to compete in this league into march and April, your home record needs to stand in there,” the coach stated. Tortorella also went on to talk about toughness. The Blue Jackets can compete with the best. That’s a fact. The question now is going to be: can the CBJ sustain their endurance and keep getting big wins deep into the 82 game season? 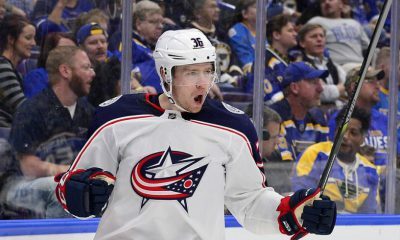 After 15 games, the CBJ are the talk around the NHL and the team stock continues to skyrocket. Columbus now has 20 points on the season, 11th-most in the NHL and 5th in the metropolitan division. The Jackets are off Saturday, but hit the road to face the Capitals in D.C. on Sunday, marking the second meeting between the two teams in less than a week.